Robert Frost, distinguished American poet and winner of four Pulitzer Prizes, was born in San Francisco in 1874. Upon his father’s death in 1885 he returned with his family to New England, where he graduated from Lawrence (Mass.) High School and attended Dartmouth College and Harvard University. In 1895 he married Elinor Miriam White. Frost had published only a few poems before 1913 when his first book, A Boy’s Will, was printed in England. Although fame came late, Frost eventually became America’s unofficial poet laureate, as acknowledged by his trips to Russia and Israel and the invitation to read at President John F. Kennedy’s inauguration. He died in 1963. Robert Frost resided in New Hampshire for about a third of his life. He attended school in Salem, taught in Derry and Plymouth, farmed for several years in Derry, and later purchased a farm in Franconia. In 1938 Frost said of his association with the state: "Not a poem, I believe, in all my six books, from A Boy’s Will to A Further Range, but has something in it of New Hampshire. Nearly half my poems must actually have been written in New Hampshire… It has been New Hampshire, New Hampshire with me all the way." The Robert Frost Papers combine the William B. Ewert-Robert Frost Collection, given to the University in 1973 by Mr. Ewert and the Elinor M. Frost-Robert Frost Archive. The collection was further added to with gifts in 1978 from Lesley Frost Ballantine, Frost's daughter, and a small number of purchases. The collection consists of an array of printed works (poetry, plays, and speeches) by Frost, including a wide variety of books and pamphlets with presentation inscriptions to friends, family, and associates – such as copy no.1 of New Hampshire inscribed to Frost’s wife, Elinor M. Frost. 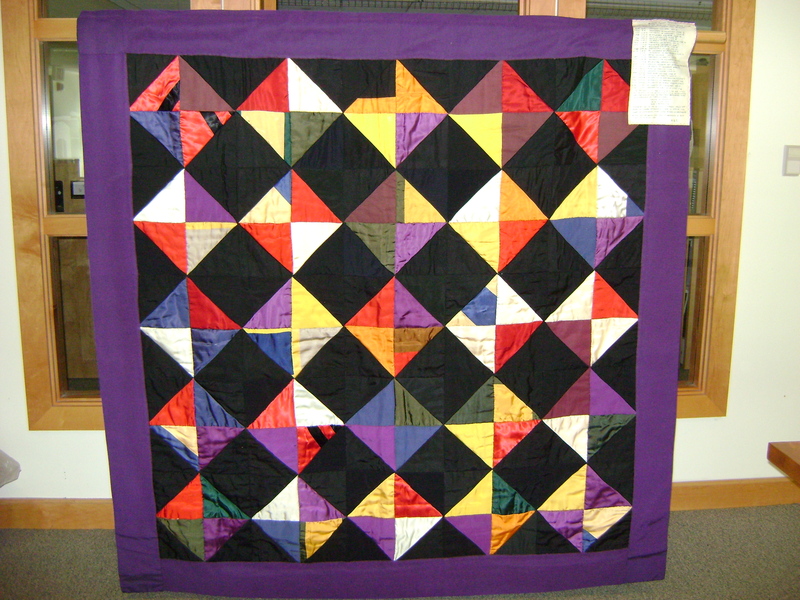 The collection also contains numerous biographical works about Frost, awards and honorary degrees, exhibit and auction catalogs, more than two dozen photographs, and memorabilia – such as Frost’s Pulitzer Prize diploma for New Hampshire (1923) and a patchwork quilt made from his academic hoods (see detail). For a list of items in the original William B. Ewert-Robert Frost Collection, see Robert Frost New Hampshire. Note: Materials stored in Series 10 are stored in Offsite Storage and require 48 hours' notice for access. [Identification of item], [folder], [box], Robert Frost Papers, 1909-1987, MC 44, Milne Special Collections and Archives, University of New Hampshire Library, Durham, NH, USA. Click here to view the Frost publications held at the University of New Hampshire Library. The collection is arranged in ten series, with oversized materials separated into their own series (9). The three largest items (a patchwork quilt, a painted portrait, and a framed Pulitzer Prize diploma) make up Series 10 and are stored separately in Museum Storage. Box 1, Folder 3 Twenty-six Clarissa Hall English themes written when she was RF’s student at Pinkerton Academy; one theme booklet, dated Sept/Oct 1909, is graded by RF. Also Hall report card, 1909-1910, with RF listed as teacher. Box 1, Folder 7 To Lawrance Thompson, May 19, 1942. A humorous request to hear from Thompson. Also, Lawrance Thompson’s report card, n.d. Box 1, Folder 15 Several Short Poems. New York: Holt, 1924. Only Edition. C&G p. 41. Five-line AIA  on page 4: "This was printed for me to give away when I went out reading. I had to give up distributing it because so many asked me to sign it. Robert Frost." Box 1, Folder 16 Birches. Bread Loaf Folder, No. 3. Middlebury, Vt.: Bread Loaf School of English, nd . First Separate Edition, Second Printing. C&G p. 105. "Accidentally on Purpose", Nov. 1929?. EMFA. "A Deserted Road", np, nd. Broadside of holograph poem. EMFA. "The Discipline Man Needed Most", [Blackwood Press], nd. Broadside. "Fire and Ice", printers demostration piece. "My November Guest." from The Unbound Anthology. New York: Poet’s Guild, n.d. Small broadside. Reprinted from North of Boston. "A Hillside Thaw." from The Unbound Anthology. New York: Poet’s Guild, n.d. Small broadside. Reprinted from New Hampshire. A Way Out. New York: Harbor Press, 1929. A Further Range. Book-of-the-Month Club Edition. New York: 1936. A reprint from the May Book-of-the-Month Club News of Comments by Christopher Morley. Bread Loaf Anthology. Middlebury, Vt.: Middlebury College Press, 1939. The Intervals of Robert Frost by Louis and Esther Mertins. Berkeley: University of California Press, 1947. New Hampshire, A Poem by Robert Frost. Hanover, N.H.: New Dresden Press, 1955. Box 1, Folder 19 The Four Beliefs. Hanover, N.H.: Ray Nash, 1944. First Edition in this format. One of 250 copies. An excerpt, with minor revision, from RF’s "Education by Poetry." Inscribed by Sidney Cox to Gerald Brace. Laid in is TLS, Cox to Brace, August 23, 1944, 4 pp. Box 1, Folder 20 A Masque of Reason. Galley proof, 1945. EMFA. Box 1, Folder 21 Bread Loaf Little Theatre Playbills: "The Hill Wife" and "A Masque of Reason," August 2, 1946; "A Masque of Mercy", August 6, 1948. Box 1, Folder 22 From A Milkweed Pod. New York: Spiral Press, 1954. First Edition. One of 598 copies with the RF imprint. Box 1, Folder 23 In the Clearing. New York: Holt, promotional materials, 1962. Box 1, Folder 24 Forest Flowers, Robert Frost. Amherst, Mass. : Friends of the Amherst College Library, 1978. One of 400 copies. "Forest Flowers" by RF, reprinted from The Pinkerton Annual 1917. With leaf of amendment containing earlier version of the poem, "Tutelary Elves." Also with ALS, Newton F. McKeon to William B. Ewert, Nov 8, 1978, thanking Ewert for locating a copy of The Pinkerton Annual 1917. Box 1, Folder 25 Robert Frost in Recital. Readings at the Poetry Center of the 92nd Street YM-YWHA in 1950, 1951, and 1952. Caedmon CDL 51523. 26 poems including: An Old Man’s Winter Night, The Oven Bird, Fire and Ice, The Aim Was Song, The Runaway, Stopping by Woods on a Snowy Evening, The Need of Being Versed in Country Up by Chance at the Constellations, Two Tramps in Mud Time, A Drumlin Woodchuck, Desert Places, Not Quite Social, The Hardship of Accounting, Come In, The Gift Outright, It Is Almost the Year Two Thousand, The Secret Sits, A Case for Jefferson, A Cabin in the Clearing, Closed for Good// America is Hard to See, Does No One At All Ever Feel This Way in the Least?, A Masque of Reason [beginning to line 227, 254-309, 316-388]. Robert Frost Reads His Poetry. At home in Cambridge, Massachusetts, May 1956. Caedmon CDL 51060. 23 poems, including: The Road Not Taken, The Pasture, Mowing, Birches, After Apple Picking, The Tuft of Flowers, My November Guest, Acquainted with the Night, Tree at My Window, West Running Brook, Death of a Hired Man / The Witch of Coos, Mending Wall, One More Brevity, Departmental, A Considerable Speck, Why Wait for Science, Etherealizing, Provide Provide, One Step Backward Taken, Choose Something Like a Star, Happiness Makes Up in Height, Reluctance. Box 2, Folder 1 The Mosher Books. Portland, Me. : Mosher Press, 1913. Only Edition. The poem "Reluctance" by RF appears on p.26. The poem previously appeared in the Youth’s Companion for November 7, 1912, and in A Boy’s Will, 1913. Box 2, Folder 2 The Atlantic Monthly for August 1915. Boston: Atlantic Monthly Co., 1915. C&G p. 84 and p. 116. Contains the first appearance of "Birches" and "The Road Not Taken" by RF, the second appearance of "The Sound of Trees" by RF, and "A New American Poet," an appreciation of RF by Edward Garnett. Box 2, Folder 3 Xerox copy of pamphlet, "Service in Remembrance of Reverend J. Warner Fobes, at the Congregational Church, Peace Dale, Rhode Island, on Wednesday Evening, December the First, Nineteen Twenty." Contains RF’s "A Friend’s Memory," his second appearance in print. Box 2, Folder 4 Harper’s Magazine for December 1920. New York: Harper & Brothers, 1920. C&G p. 86. Contains "A Group of Poems" by RF. First appearance of "Fire and Ice," "Wild Grapes," "The Valley’s Singing Day," and "The Need of Being Versed in Country Things." Box 2, Folder 5 In Memoriam Edward Morgan Lewis 1872-1936. Durham, N.H.: University of New Hampshire, 1936. One of 800 copies issued at a memorial service for the University’s eighth president. Includes address by RF. Box 2, Folder 6 Proceedings of the American Academy of Arts and Letters and the National Institute of Arts and Letters. Second Series, Number One. New York: Spiral Press, 1951. Contains first printing of "Blashfield Address" by RF. EMFA. Box 2, Folder 7 Sixty American Poets, 1896-1944. Edited by Allen Tate. Washington, D.C.: Library of Congress, 1954. Revised Edition. Includes RF checklist. LFB bookplate and label. EMFA. Box 2, Folder 8 "One More Brevity" by Robert Frost. The Phillips Exeter Bulletin for January 1957 Vol. 53 No. 1. Box 2, Folder 9 Dedication (and) "The Gift Outright" (by Robert Frost) The Inaugural Address (of John Fitzgerald Kennedy) Washington, D.C., January the Twentieth, 1961. New York: Printed for The Friends of Holt, Rinehart and Winston, Inc., 1961. First Edition, Second Issue (April 1961). In Wrappers. One of 800 copies printed for distribution to guests who attended the reception given for RF by the members of the Cabinet of the United States. Box 2, Folder 10 "What Became of New England?" Oberlin, Ohio: Oberlin College, 1938. First Separate Edition. A reprint from the Oberlin Alumni Magazine for May 1938, of the Commencement Address delivered by RF at Oberlin College on June 8, 1937. Box 2, Folder 11 Program, Hood Memorial Junior High School, December 11, 1952. Lists "Professor Wilbert Snow – Tribute to Robert Frost" and "Robert Frost’s response." Box 2, Folder 12 Dartmouth College Commencement Address, 1955. In the Dartmouth Alumni Magazine. Box 2, Folder 13 A Talk for Students. New York: Fund for the Republic, 1956. Only Edition. An extemporaneous talk by RF presented at the twenty-eighth annual commencement of Sarah Lawrence College, Bronxville, New York, June 7, 1956. Box 2, Folder 14 Robert Frost on "Extravagance." Hanover, N.H.: Dartmouth College, 1963. First Separate Edition. The text of RF’s last college lecture, delivered at Dartmouth College on the evening of November 27, 1962. Reprinted from the Dartmouth Alumni Magazine for March 1963. Certificate awarding RF the Golden Rose of the New England Poetry Club, 1928, for achievement in poetry. Partly printed document completed in calligraphy underneath an embossed golden rose. Certificate awarding RF the medal of The Holland Society of New York. November 21, 1957. Citation for Signet Society Medal for achievement in the arts, Class of 1901, Harvard University. March 22, 1958. Announcement that Frost was awarded the Bollingen Prize in Poetry, Yale University News Bureau press release, 1962. Typed list of various honors and awards Frost received, ca. 1957. Box 2, Folder 16 Doctor of Letters, Bates College, Lewiston, Maine. June 15, 1936; Princeton University, Princeton, 1941. Box 2, Folder 17 Citation for Doctor of Letters, Colgate University, Hamilton, New York. June 12, 1950. Box 2, Folder 18 Doctor of Laws, University of Cincinnati, Cincinnati, Ohio. November 15, 1954. Box 2, Folder 19 Doctor of Letters, University of Rhode Island, Kingston, Rhode Island. December 8, 1955. Box 2, Folder 20 Doctor of Letters, Oxford University, June 4, 1957. Single leaf broadside which prints in Latin the oration delivered by the Public Orator’s Deputy (the Principal of Jesus College) in a convocation held on 4 June 1957. Together with a typed manuscript, unsigned, carbon of the original, which translates the citation. This oration was read on the occasion of the awarding of an honorary Doctor of Letters degree to RF by Oxford University, Oxford, England. Box 2, Folder 21 Doctor of Letters, Cambridge, England: University of Cambridge, 13 June 1957. A 12-page printed leaflet which includes the speeches of the Deputy Orator at the presentation to the Chancellor of the recipients of honorary degrees. Among those receiving degrees was RF, who was awarded a Doctor of Letters. 3 copies. Box 2, Folder 22 Doctor of Humane Letters, Ohio State University, Columbus, Ohio. December 20, 1957. Together with a typed manuscript unsigned, containing the citation. Box 3, Folder 1 Doctor of Laws, University of Michigan, Ann Arbor, Michigan. June 16, 1962. Box 3, Folder 2 Doctor of Humane Letters, University of Detroit, Detroit, Michigan. November 30, 1962. Together with citation. Box 3, Folder 3 LAMP (yearbook) of Lasell Junior College, 1941. Auburndale, Mass. Photo of RF as "honorary member" of the class. Also facsimile of holograph poem "Come In." Box 3, Folder 4 RF 80th and 85th Birthday Celebrations, March 26, 1962. Menu for Robert Frost’s Eightieth Birthday Dinner, held at Amherst College on March 26, 1954. Robert Frost’s Eighty-fifth Birthday Dinner, held at the Waldorf Astoria, New York City, on March 26, 1959. A Remembrance Collection of New Poems. New York: Holt, 1959. First and Only Edition. One of 150 copies. Copies of this booklet were distributed to the guests who attended RF’s eighty-fifth birthday dinner. Box 3, Folder 5 RF 88th Birthday Celebration, March 26, 1962. Menu, press releases, and guest list. Warren, Robert Penn, "Tribute to Robert Frost"
Box 3, Folder 6 RF Memorial Service, Johnson Chapel, Amherst College, February 17, 1963. "In Memory of Robert Frost, March 26, 1874-January 29, 1963." Program for the Memorial Service for Robert Frost held at the Johnson Chapel, Amherst College, on February 17, 1963. Contains the eleven poems by RF, that were read by Mark Van Doren. Together with the printed announcement for the memorial service. This announcement is in the original envelope addressed by LFB to "Mr. and Mrs. Harold Baily." Robert Frost, 1874-1963. By Louis M. Lyons. New York: Spiral Press, 1963. Only Edition. The text of the broadcast over WGBH-TV made by Mr. Lyons on the evening of January 29, 1963. One of 500 copies printed for the friends of RF who attended the Memorial Service in Amherst, Mass., on February 17, 1963. Robert Frost Fellowship in Poetry, Bread Loaf Writers’ Conference, Middlebury, VT, news release, 1956. Program for the Dedication of the Robert Frost Room in the Jones Library, Amherst, Massachusetts, 21 October 1959. Laid in is another Jones Library publication, "Robert Frost: A Short Reading List." All the Difference. By Roy P. Basler. Amherst, Mass. : Jones Library, 1959. Only Edition. A talk on the occasion of the dedication of the RF Room in the Jones Library, October 21, 1959. Under That Arch. A keepsake issued by the Dartmouth College Library on the occasion of the opening of its Robert Frost Room, April 19, 1962. Contains extracts from a reminiscence by RF in a 1958 interview. The Robert Frost Award from the Poetry Society of America, press releases, 1959-1961. The Presidential Convocation and the Groundbreaking for the Robert Frost Library. Amherst, Mass. : Alumni Council of Amherst College, 1963. First Edition. Special issue of the Amherst Alumni News for Fall 1963. Contains an address by President John F. Kennedy and "Frost and Stone" by Archibald MacLeish. "The Place of the Artist in Society" by President John F. Kennedy. Spoken at the Dedication of the Robert Frost Library, Amherst College, Massachusetts. New York: Spiral Press, 1964. First Separate Edition. One of 600 copies. Imprinted: "Greetings and Holiday Good Will 1964-1965 from Ann and Joseph Blumenthal." These remarks were actually spoken at the ground-breaking ceremony. "A Luncheon in Commemoration of the Ninetieth Anniversary of the Birth of Robert Frost." California Friends of Robert Frost, San Francisco, CA, March 26, 1964. Also a newsclipping about the dedication of the Robert Frost Plaza in San Francisco, a letter to UNH Librarian Donald Vincent, and the keepsake: Robert Frost’s Woodchopper Friend, about J.J. Lankes, 1977-1978. "Robert Frost Speaks Departmentally." New York: Spiral Press, 1965. First Edition. This keepsake, with text drawn from letters of Robert Frost, was printed to celebrate the dedication of the Robert Frost Library, Amherst College, October 24, 1965. It contains a Meriden Gravure Company facsimile of a manuscript of RF’s poem "Departmental" composed in the form of a leaflet. Laid in is a single small sheet of paper folded once to make four pages. This is imprinted on page 3: "Holiday greetings at Christmas 1965 from Ann and Joseph Blumenthal." Invitation and program for presentation of the George H. Browne Robert Frost Collection to Plymouth State College, March 23, 1969. 2 copies. Robert Frost: A Remembrance. [Amherst, Mass. ]: Friends of the Amherst College Library, 1974. One of 500 copies printed at the Stinehour Press. Contains first printing of RF’s "Fragment Written in England in 1914 or 13." Norman Rockwell’s Medallic Tribute to Robert Frost. Franklin Mint Corporation, 1974. Includes certificate of authenticity and booklet with poems. Twelve solid sterling silver art medals, a hallmarked Proof Set issued in a single limited edition. Each medal bears an original work of art by Norman Rockwell interpreting one of RF’s poems. Struck in honor of RF’s 100th anniversary of his birth. The Dedication of the Richards-Frost Room, Boston University, 1975. One of 350 copies. Includes facsimile of an early draft of "A Cabin in the Clearing" by RF, from a 1950 notebook in the Richards-Frost Collection. Brochures. With LFB holograph statement, April 15, 1977, welcoming Franconia Place. Invitation and program for dedication of the Robert Frost Farm, May 22, 1977. With printed proclamation by May 22, 1977 Robert Frost Day. Keepsake from dedication of RF Plaza, March 22, 1978. With other materials from California Friends of RF. Invitation and program for planting of orchard at Robert Frost Farm, May 20, 1979. 2 copies. Carbon copies of 16 identical letters sent by Gov. Peterson on June 17, 1969, to 16 individuals asking them to serve as members of the "Robert Frost Committee." Photostatic copies of replies from 11 of the individuals. Included are letters from Hyde Cox; Elizabeth Yates McGrael; John B. Dickey, President of Dartmouth; Raymond P. Holden; and Edward Connery Lathem. Mimeographed agenda for June 24, 1969 meeting of the committee. Four-page mimeographed "Minutes of June 24, 1969, Meeting of the Robert Frost Committee." 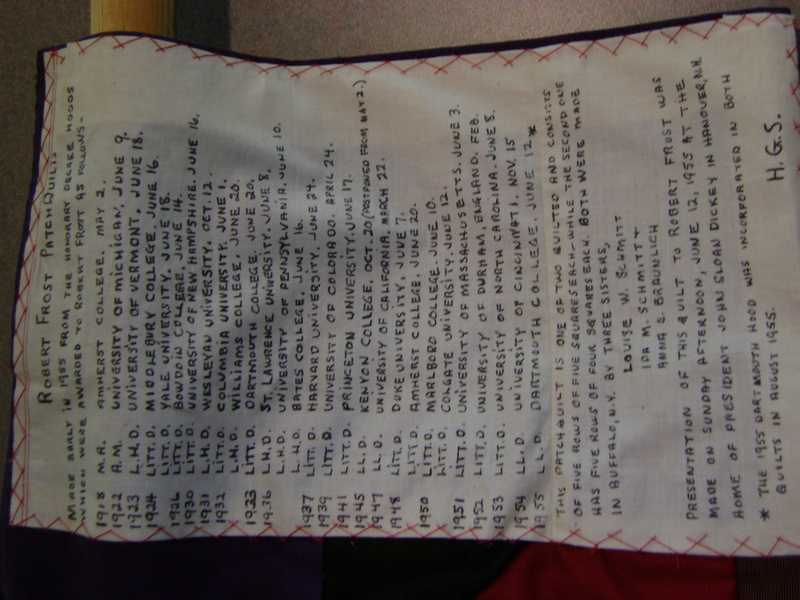 Mimeographed list of the 20 members Governor Peterson appointed to the Robert Frost Committee. Included on this list are Lesley Frost, Hyde Cox, John B. Dickey, E. C. Lathem, Elizabeth Yates, Lawrance Thompson, and Raymond Holden. Two-page mimeographed "History of the Robert Frost Homestead" detailing its acquisition by the State of New Hampshire. TLS, May 6, 1969, from Lemuel A. Garrison, Regional Director of the Northeast Region of the National Park Service, to Gov. Peterson, requesting that he make arrangements to receive the bronze landmark plaque and the official Registered National Historic Landmark Certificate for the RF Homestead. With carbon copies of 4 other letters relating to the date for the presentation of the plaque and certificate. The presentation was made in Governor Peterson’s office on June 23, 1969. Original typescript of a two-page news release dated December 18, 1969, and headlined "Gov. Peterson Names Three as Trustees of Robert Frost Foundation." Typed on Gov. Peterson’s official stationery. Five-line autograph inscription by the Gov. on page 2: "It is with pleasure that I autograph this piece of ephemera for Bill Ewert’s RF Collection. Walter Peterson Governor, N.H."
Box 3, Folder 10 Memorabilia from Robert Frost Day, March 26, 1974. Invitations, programs, etc. for ceremony. Materials regarding commemorative stamp. Box 4, Folder 1 Congressional Record, March 26, 1974, with tribute to RF, "Robert Frost: Poet and Sage" by Senator Thomas McIntyre on pp. S4424-S4425. Box 4, Folder 2 Robert Frost: Lectures on the Centennial of His Birth. Washington, D.C.: Library of Congress, 1975. Louis Untermeyer’s copy. Laid in is TLS, March 21, 1975, John C. Broderick of the Library of Congress to Untermeyer, presenting the copy. Box 4, Folder 3 North of Boston by Robert Frost, review, London: David Nutt, ca. 1914. Box 4, Folder 4 Robert Frost, The Man and His Work. By Amy Lowell, et al. New York: Holt, nd . First Edition, First Issue. C&G p. 143. Robert Frost, The Man and His Work. By Amy Lowell, et al. New York: Holt, . First Edition, Second Issue. C&G p. 143. Robert P. T. Coffin’s copy. Box 4, Folder 5 The Less Traveled Road: A Study of Robert Frost. By Caroline Frost Ford. Cambridge, Mass. : Harvard University Press, 1935. Radcliffe Honors Theses in English, Number 4. Box 4, Folder 6 Robert Frost: Godfather of Bread Loaf. By W. Storrs Lee. Np, nd. 8pp. "Reprinted from an article by W. Storrs Lee in the September 1939, issue of "The Middlebury College News Letter." Box 4, Folder 7 Touchstone. Amherst, Mass. Robert Frost Issue, 1939. Box 4, Folder 8 An Anniversary. Program from RF reading, Tufts College, May 22, 1940. Reprints "The Sound of the Trees," "Birches," and "The Road Not Taken". From Robert P. T. Coffin papers. Box 4, Folder 9 Robert Frost: New England’s Poet. By Marion Hazel Barrett. Boston University School of Education, 1942. MA thesis by former student of RF. Carbon copy with holograph corrections. Box 4, Folder 10 The New Hampshire Troubadour for November 1946. Edited by Herbert F. West. Concord, N.H.: Rumford Press, 1946. 2 copies. Copy l: 3 line autograph inscription by the editor at the conclusion of his "Foreword" on p.5: "Herbert F. West for Bill and Mary Ewert." Box 4, Folder 11 Now and Then: A Journal of Books and Personalities. For Autumn 1948. London: Cape, 1948. "Robert Frost," a remembrance by John W. Haines, appears on pp. 9-11. Box 4, Folder 12 "Robert Frost’s Life in Derry." By Robert S. Chase. Student paper, original house at Dartmouth College. 16pp. Xerox of typewritten manuscript, 1952. Box 4, Folder 13 With Robert Frost, Poet of Eternal Return. By Maria de Villarino. Washington, D.C.: Department of State, 1956. First Edition in English. Five mimeographed sheets containing a translated article from the November 4, 1956 issue of La Nacion. Box 4, Folder 14 "Robert Frost ’96 Reminisces About His Freshman Days." Hanover, N.H.: Dartmouth College, 1959. 1st Separate Edition. Excerpts from an interview by Edward Connery Lathem ’51. Reprinted from the Dartmouth Alumni Magazine, March 1959. Box 4, Folder 15 Robert Frost. By Paul Engle. Iowa City: State University of Iowa, 1959. One of 3000 copies distributed by the State University of Iowa on the occasion of RF’s visit, April 13, 1959. Poem about RF. Box 4, Folder 16 Robert Frost. By Lawrance Thompson. Minneapolis: University of Minnesota Press, 1959. 1st Edition. No. 2, University of Minnesota Pamphlets on American Writers. Box 4, Folder 17 Henry Holt and Company (publishers) file of items relating to RF, mainly press releases and memos, 1947-1960. Box 4, Folder 18 Pageant, March 1960. "Robert Frost: Greenapple Genius." Box 4, Folder 19 Saturday Review for March 24, 1962. "Robert Frost: American Bard" by John Ciardi appears on pp. 15-17, 52-54. Box 4, Folder 20 I[n]. M[emoriam]., Robert Frost. By Edmund Palmer Clarke. Watertown, Mass. : First Parish of Watertown, 1963. Only Edition. The text of a sermon delivered on February 10, 1963. Box 4, Folder 21 Robert Frost and the Spiral Press. New York: Spiral Press, 1963. First Edition. One of 450 copies of this brief memoir by Joseph Blumenthal. Imprinted: "With Greetings and Holiday Good Wishes 1963-64 from Ann and Joseph Blumenthal." Box 4, Folder 22 Holt, Rinehart and Winston, Inc. (publishers) file of items relating to RF, mainly press releases and memos, 1960-1963. Box 4, Folder 23 Robert Frost. By Theodore Morrison and Edward Hyde Cox. Hanover, N.H.: Friends of the Dartmouth Library, 1964. Only Edition. Box 4, Folder 24 Robert Frost, A Backward Look. By Louis Untermeyer. Washington, D.C.: Library of Congress, 1964. Only Edition. Box 4, Folder 25 "Edward Morgan Lewis and Robert Frost, 1916-1936." By Hobart Lewis Morris, Jr. 1966 typewritten manuscript. Copy. Original, Oneida County Historical Society. Box 5, Folder 1 Robert Frost, The Early Years, 1874-1915. By Lawrance Thompson. New York: Holt, 1966. Uncorrected proofs. Box 5, Folder 2 Historical New Hampshire for Summer 1967. Concord: New Hampshire Historical Society, 1967. "Robert Frost’s Affection for New Hampshire" by Lawrance Thompson on pp. 3-26. Robert Frost’s Affection for New Hampshire. Lawrance Thompson. Derry, N.H.: Robert Frost Trustees, . Reprint of above. Box 5, Folder 3 The Courier for Summer 1969. Syracuse, N.Y.: Syracuse University Library Associates, 1969. "Robert Frost – 5th June 1957″ by Reverend Canon J. E. Gethryn-Jones on pp. 1-8. Box 5, Folder 4 Checklist of Robert Frost. Compiled by Donald J. Greiner. Columbus, Ohio: Charles E. Merrill, 1969. Wrappers. Box 5, Folder 5 Out of Stars, An Appreciation of Robert Frost. By Rabbi Victor E. Reichert. Cincinnati, OH: Hirschfeld Printing Co., 1969. Only Edition. In Original Envelope. Six-line APIA on the front cover from Rabbi Reichert to William B. Ewert. Out of Stars, An Appreciation of Robert Frost. Six-line APIA on the inside front cover from Louise Reichert to LFB. Box 5, Folder 6 "Robert Frost’s Career Launched after 40," Peterson, Robert, article from The Indianapolis Star, photocopy of newsclipping, 1970? Box 5, Folder 7 A Poet Recognized: Notes About Robert Frost’s First Trip to England and Where He Lived. By David Tatham. Privately printed, 1970. One of 250 copies SA. Laid in is ALS from the author to LFB, February 28, 1972. Box 5, Folder 8 Myfanwy Thomas Remembers Robert Frost. Amherst, Mass. : Friends of the Amherst College Library, 1970. Only Edition. In Original Envelope. One of 400 copies printed at the Stinehour Press. Box 5, Folder 9 Introduction, The Poetry of Robert Frost. By E. C. Lathem. Barre, Mass. : Imprint Society, 1971. First Separate Edition. One of 250 copies. The Poetry of Robert Frost. Edited by E.C. Lathem. Barre, Mass. : Imprint Society, 1971. Box 5, Folder 10 "Editing Robert Frost." By Edward Connery Lathem, ’51. Reprinted from the Dartmouth Alumni Magazine of February 1972. Box 5, Folder 11 "Between Poets: Robert Frost and Harriet Monroe" by Lesley Lee Francis. Offprint from The South Carolina Review. Volume 19, Summer 1987. Special issue. Signed by the author. Box 5, Folder 12 The Earle J. Bernheimer Collection of First Editions of American Authors, Including His Remarkable Collection of the Writings of Robert Frost. New York: Parke-Bernet Galleries, 1950. A priced copy of this auction catalog. Box 5, Folder 13 The Collection of Mrs. W. George Parks of Robert Frost (and) Edna St. Vincent Millay. New York: Parke-Bernet Galleries, 1968. A priced copy of this auction catalog. Box 5, Folder 14 An Exhibition of the Work of Robert Frost. Compiled by Martin K. Howes. Meadville, Pa.: Allegheny College, 1938. Only Edition. This exhibition catalog contains the only printing of a letter written by RF to the critic, H. S. Jacobs, on April 29, 1915. Box 5, Folder 15 Fifty Years of Robert Frost. Edited by Ray Nash. Hanover, N.H.: Dartmouth College Library, 1944. 1st Edition, Special Issue. In Binding and Containing Illustrations. This exhibition catalog contains the 1st printing of RF’s poem, "In England," p. 15. Inscribed by Sidney Cox to Gerald Brace, 1944. Box 5, Folder 16 Announcement by Friends of Duke University Library of exhibit in honor of RF’s 75 birthday, March 26, 1950. Box 5, Folder 17 Robert Frost, 1874-1963. Charlottesville: University of Virginia, 1966. Only Edition. An exhibition catalog. Box 5, Folder 18 Robert Frost: His Poems, Portraits & Printers, 1913-1963. Compiled by Richard H. Templeton. Lake Forest, Ill.: Lake Forest Academy, 1963. Only Edition. An exhibition catalog. Box 5, Folder 19 Doc Cook: A Passionate Commitment. Catalog of an Exhibit, Starr Library, Middlebury College, Middlebury, VT. May 6 - August 30, 1985. Box 5, Folder 20 Robert Frost at Agnes Scott College. Compiled by Edna Hanley Byers. Decatur, Ga.: Agnes Scott College, 1963. Only Edition. A descriptive catalog of the contents of the Robert Frost Collection at Agnes Scott College, signed by the compiler on the title page: "Edna Hanley Byers." Box 6, Folder 1 Checklist of Robert Frost Library. New York University Libraries, Division of Special Collections, May 1970. With correspondence with LFB regarding additions in 1975. Box 6, Folder 2 George H. Browne Robert Frost Collection. Plymouth, N.H.: Plymouth State College, 1969. Only Edition. A checklist of the manuscripts, letters, photographs, and varia contained in the collection. Together with Winter 1969 and Spring 1969 issues of the Plymouth State College Alumni Association’s publication, Conning Tower Gleanings. Both issues contain illustrated articles about the George H. Browne Robert Frost Collection. A Finding List for the George H. Browne Robert Frost Collection. Plymouth, N.H.: Plymouth State College, 1981. Second Edition. Box 6, Folder 3 Poems In Manuscript. Selected and Introduced by James Thorpe. San Marino, Cal. : Huntington Library, 1970. First Edition. A facsimile reproduction of original manuscripts printed by Grant Dahlstrom at the Castle Press. RF’s poem, "Nature’s Neglect," is included on p. 34. Laid in is a presenting note from Grant Dahlstrom to William B. Ewert dated March 7, 1972.
Letters In Manuscript. Selected and Introduced by James Thorpe. San Marino, Cal. : Huntington Library, 1971. First Edition. A facsimile reproduction of original letters printed by Grant Dahlstrom at the Castle Press. A letter from RF to Susan Hayes Ward, 1894, is included on pp. 41-44. Box 6, Folder 6 Card announcing that "Funeral services for Elinor Frost will be held at Johnson Chapel, Amherst College, Amherst, Massachusetts, at three o’clock in the afternoon of Friday, April the twenty-second ." Box 6, Folder 8 Trivet with a picture of Frost and the poem "Stopping by the Woods on a Snowy Evening"
Box 7, Envelope 1 1915. Contemporary print of the portrait of RF taken at Eaton’s Studio in Littleton, N.H. Used as a publicity photo by Holt for their editions of RF’s first three books with the caption, "New England’s New Poet." Box 7, Envelope 13 [ca. 1921] Photo of RF, 6″ x 10″, at Stone Cottage, South Shaftsbury, Vermont. Taken by Alton H. Blackington, Lynn, MA. It accompanied "A Visit to South Shaftesbury" by Paul Waitt, Boston Traveler, April 11, 1921; reprinted in "Interviews With Robert Frost" edited by Edward Connery Lathem. Box 7, Envelope 14 1928. Glossy print of photo used in Robert Frost: The Years of Triumph, 1915-1938, the second in the 3-volume biography by Lawrance Thompson. Publicity photo circulated by Holt. Box 7, Envelope 19 1954. Robert Frost. Middlebury, Vt.: Middlebury College, 1954. Booklet containing 12 photos of RF at Bread Loaf in 1940s and 50s. 6-line inscription by RF on inside cover: "To Lesley and Joe that they may not be too discouraged about the way the world’s going R.F. with affection"
Box 7, Envelope 29 Ibid: Typescript of final version of RF’s "Evening in a Sugar Orchard"
Box 8, Item 5 Framed Woodcuts by J.J. Lankes: "Robert Frost’s Pasture"
Oversize Box 1, Folder 1 "My Butterfly", facsimile of the mss. of RF’s first published poem. Produced by the California Friends of Robert Frost, n.d. Oversize Box 1, Folder 2 Doctor of Letters, Dartmouth College, Hanover, New Hampshire, June 20, 1933. Diploma awarded to RF. As is the case with the subsequent diplomas, a partly printed document completed in calligraphy, signed by a college or university official, and bearing a seal. Oversize Box 1, Folder 4 Doctor of Literature, University of Massachusetts, Amherst, June 3, 1951. Together with a one-page typed manuscript, unsigned, which contains the citation read upon conferring the degree. Oversize Box 1, Folder 9 Doctor of Letters, Syracuse University, Syracuse, New York, April 21, 1959. Together with a two-page manuscript signed by William Pearson Tolley, Chancellor of the University. This manuscript contains the citation read by the Chancellor upon conferring the degree. Oversize Box 1, Folder 11 Doctor of Letters, University of Florida, Gainesville, Fla, January 13, 1960. Together with presentation certificate and citation. Oversize Box 1, Folder 13 Printed copy of the joint resolution adopted by the Senate and House of Representatives of the State of Vermont declaring RF to be Poet Laureate of the State of Vermont, followed by a printed citation from the Governor of Vermont. This copy was presented to RF at ceremonies in July, 1961, and is signed by F. Roy Keyser, Jr., Gov. of Vermont, and dated by him July 21, 1961. The awarding of this certificate prompted RF to write the poem, "On Being Chosen Poet of Vermont." Oversize Box 1, Folder 14 The Bowdoin Orient, March 29, 1944. Contains account of RF lecture at Bowdoin College. From Robert P. T. Coffin papers. Oversize Box 1, Folder 15 "Robert Frost, Carl Sandburg." Life Educational Reprint #7. New York: Time, 1967. First Separate Edition. Articles about RF and/or Carl Sandburg reprinted from Life for December 1, 1961, February 8, 1963, and August 4, 1967. Oversize Box 1, Folder 16 Poster, "Robert Frost Will Lecture At Wells College Thursday, Nov. 21st '35 8:00 P.M. Macmillan Hall." Woodcut by J. J. Lankes. From Robert P. T. Coffin papers. Oversize Box 1, Folder 17 1961. Photographic reproduction, 16″ x 19″, of sketch of RF by Charles A. Mahoney done from life at Boston University Commencement. The following items are housed in the off-site storage building and will require additional arrangements for viewing. Please inquire for further details. Item 1 1974. Watercolor portrait by Charles A. Mahoney, painted from life sketches made at above event. This quilt was made early in 1955 from 22 honorary degree hoods awarded to RF between 1918 and 1955. According to a holograph note signed in initials by Howard G. Schmitt and incorporated into the quilt, "this patch quilt is one of two quilted and consists of five rows of five squares each, while the second one has five rows of four squares each. Both were made in Buffalo, New York, by three sisters, Louise W. Schmitt, Ida M. Schmitt, Anna S. Braunlich. Presentation of this quilt to Robert Frost was made on Sunday afternoon, June 12, 1955, at the home of President John Sloan Dickey in Hanover, New Hampshire. The 1955 Dartmouth hood was incorporated in both quilts in August 1955." Item 3 Pulitzer Prize Diploma, awarded to RF on 4 June 1924 for New Hampshire, A Poem with Notes and Grace Notes, the best volume of verse of the year by an American author. Partly printed in document completed in calligraphy and signed by Nicholas Murray Butler as President of Columbia University.